If you look on the side of the Plaza Hotel & Casino, you may see something that looks like it was pulled from a horror or suspense comic book. 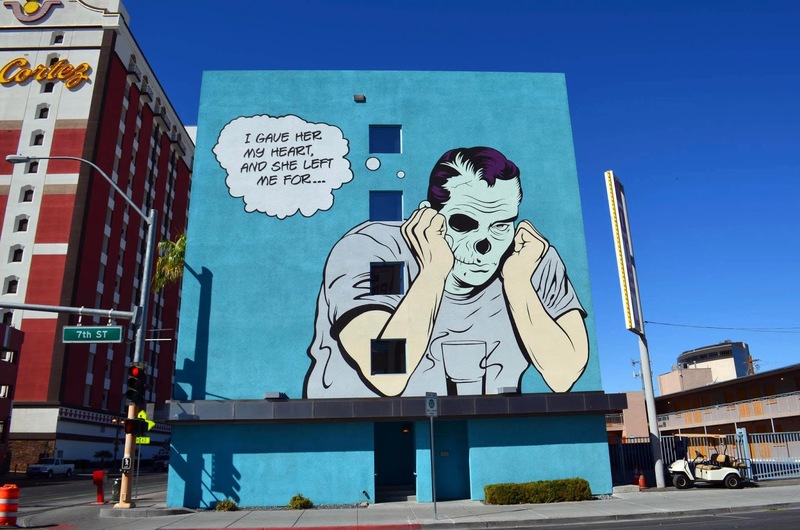 The latest piece of art to join the Downtown Las Vegas area is a large mural created by D*Face, an English multimedia street artist known for his sold-out galleries and collaboration with the world’s top music artists. His style can be considered a modern twist on retro comics and skeletons are a frequent staple of his work.D*Face’s latest masterpiece is his tallest and widest mural ever created. Overlooking the pool deck of the Plaza Hotel & Casino, D*Face created a chilling scene reminiscent of old horror comics with a retro feel.The mural, lacking any captions or words, encourages viewers to interpret the scene, which includes a frightened young blonde woman with big blue eyes, a menacing skeletal hand, and a slowly opening door. The artwork stretches across three different parts of the Plaza Hotel & Casino, creating a depth effect for viewers.Completing the mural was a challenge that D*Face relished. It pushed him to overcome his fear of heights and work within the uneven architecture of the Plaza Hotel to create something unique. D*Face was lifted on a platform with a rope pull system to finish the mural.D*Face masterfully used the architecture and placement of the mural to create shadows that extend the boundaries of the mural and transform it from a two-dimensional piece of art to a surreal 3-D mural that comes alive as the sun sets. 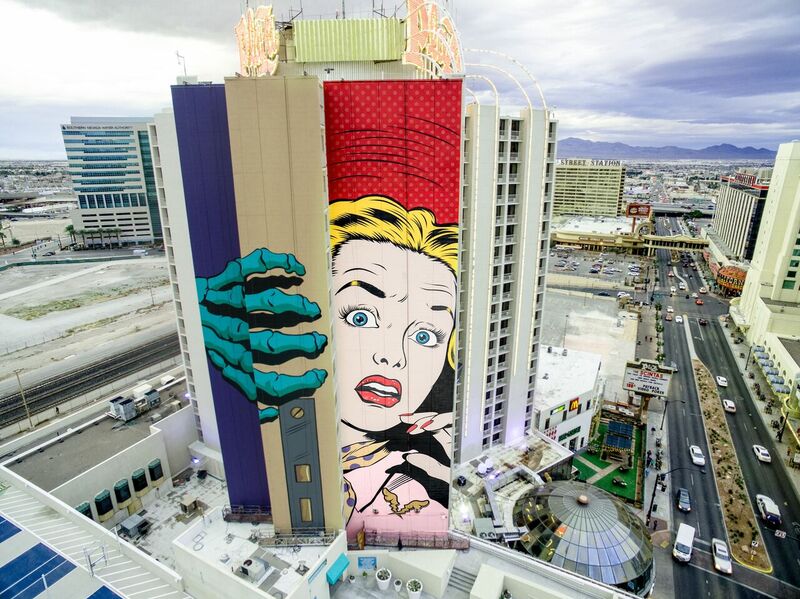 D*Face’s mural joins Shepard Fairey’s colossal mural on the Plaza Hotel & Casino in Downtown Las Vegas. “D*Face”, a.k.a. Dean Stockton is an English multimedia street artist known for using mediums like spray paint, stickers, posters, and stencils to create beautiful modern pieces of street art. He started creating his unique and recognizable characters one day while sitting in the office trying to pass the time. His life was forever changed as his artistic passion continued to grow and he decided to pursue his art as his life’s work.D*Face has been of the most influential artists in the Downtown Las Vegas art scene, alongside Shepard Fairey, Zio Ziegler, Chor Boogie, Ruben Sanchez, and more. His retro feeling art reminiscent of old comic books contributes to the classic “Old Vegas” vibe that has become a staple of the Downtown area.D*Face is a common fixture at Life is Beautiful and his latest piece joins several others that he created for the eclectic Las Vegas festival. The festival is known for its creative artwork and is responsible for contributing many of the murals that now flood Downtown Las Vegas with vibrant colors and unique styles. Below is one of the murals he did for Life Is Beautiful 2013. Some of his most well-known work includes album cover art for Christina Aguilera’s album Bionic, which shows Aguilera’s face as half human and half painted robot. More recently, he did the cover art for Blink-182’s album California, which features a crying woman and a skeleton sitting in a car.D*Face’s influences include hip-hop, punk rock music, animated cartoons, and fellow street artist, Shepard Fairey.Click here to view Plaza’s First 21-Story Mural (by Shepard Fairey).Click here to view Plaza’s Third 21-Story Mural (by Faile).